Things got pretty "Strange" for Jimmy Kimmel on Tuesday. Disney (DIS) and Marvel Studios premiered the first trailer for its upcoming film, "Doctor Strange," on Jimmy Kimmel Live Tuesday night. 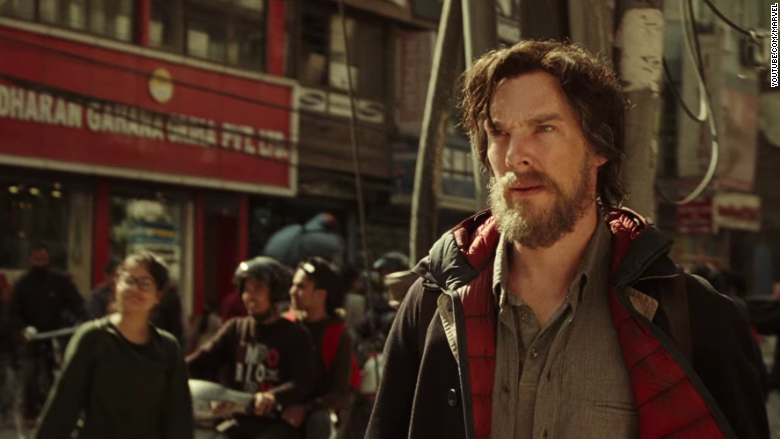 The roughly two-minute trailer showed off one of Marvel's lesser known heroes, Dr. Stephen Strange, a surgeon played by Benedict Cumberbatch who becomes a powerful sorcerer. The trailer begins by showing Strange recovering from a car accident before learning about the mystical side of the Marvel universe. "There are other ways to save lives," Tilda Swinton's The Ancient One tells Strange in the trailer. "There's so much you don't know." "Teach me," begs Strange after traveling through a literal upside down reality. The premiere of the "Doctor Strange" trailer didn't give much away in terms of plot, but did present what looks to be one of Marvel's trippiest and arguably ambitious works to date. Much like 2014's "Guardians of the Galaxy" and 2015's "Ant Man," Disney is hoping to find success with some of Marvel's cult heroes outside of fan favorites like Captain America and Iron Man. The film, which opens on November 4, also stars Rachel McAdams and Chiwetel Ejiofor. Cumberbatch in character presented the brief trailer alongside Kimmel who didn't really know what powers Doctor Strange wielded. "What do you do?" asked Kimmel. "Can you do, like, balloon animals?" Cumberbatch explained he really doesn't do kids parties but regardless made a balloon giraffe before popping it in frustration. "Doctor Strange" will be the first Marvel film to follow "Captain America: Civil War." That film, which opens on May 6, is predicted to be one of the biggest blockbusters of the year.